The final light in North Shields is the Tynemouth North Pier light situated, as its name implies, at the end of the northern breakwater that defines the mouth of the Tyne. 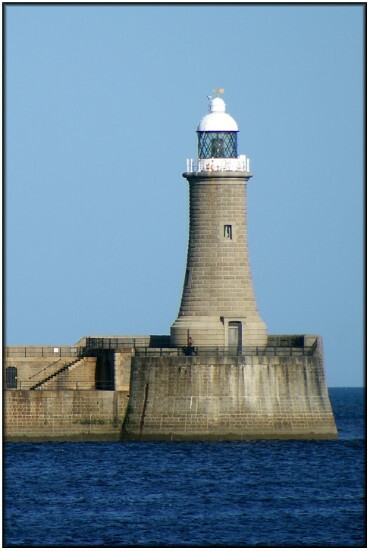 The unpainted stone tower with its white lantern is sited on the knuckle at the end of the breakwater and the pier. The pier itself was subject to several major problems during the course of its construction. High seas breached the unfinished pier in 1867 and 1897 and, when completed, the structure was found to be unstable as a result of which it had to be rebuilt practically from scratch. Construction started in 1854, but was not completed until 1910. Despite this the light itself was first lit in 1903 and was therefore operational some seven years before the pier on which it stands was completed. The pier is reputed to be publicly accessible although I've never been on that side of the river so I have no first hand information on this. Access aside, perfectly reasonable photos of the light can be obtained from the end of the Herd Groyne (and other locations in South Shields), although a longish zoom would be an advantage. The light is generally favourable from around mid morning onwards.